“Amazoness Queen” + 1 “Amazoness” monster Other “Amazoness” cards you control cannot be destroyed by battle or card effects. If your “Amazoness” monster attacks a Defense Position monster, inflict piercing battle damage to your opponent. If this face-up Fusion Summoned card is destroyed by battle, or leaves the field because of an opponent’s card effect while its owner controls it: You can Special Summon 1 “Amazoness Queen” from your hand, Deck, or GY. The Amazoness archetype has always been hot garbage, and Amazoness Empress highlights everything that has been wrong with them in the past. Always behind the times and never generating the plusses necessary to justify use in even casual play. To be honest, there has never been a truly good Amazoness monster, and I’m almost willing to extend that statement to all Amazoness cards. If you were to try and guess what the theme of Amazoness is, you’d probably guess it’s some sort of aggresive attack-based focus, but that was always wacky to me because until Empress and Liger were released, the Amazoness with the highest attack for a long time was Queen with a paltry 2400 ATK. Somewhere in the distance, I hear Summoned Skull laughing aloud. The chicks from the Amazon have always been two to three years behind. And now Konami has released this mess, yet another monster that requires multiple resources to summon. I don’t know what the point of such a card is if it’s so behind the current meta that just reading it makes you frown. Are there really any fans out there who would get psyched up for a crap Amazoness fusion monster? At the very least, this should have been a link monster! Even with the same effect, it would have been something! Terrible card is terrible. And the rest of the new support is the same. Amazoness Empress starts off our Top 10 Circuit Break cards. This is some serious protection for Amazoness cards Empress provides. Protection against destruction by battle and card effects is just what the archetype needs (any archetype appreciates that kind of support). Piercing damage for ANY Amazoness monster helps deal more damage and combo with using cards like Book of Eclipse or Zero Gravity. Empress is a 1-for-1 upon leaving the field via an opponent’s card or by battle, giving you back a Queen from anywhere (minus banished). This is a great card for the archetype, easy to summon, good stats, and great protection behind it. You will have to change some stuff up to now Fusion Summon in the deck, but that’s okay if you are summoning this card. This is just what this archetype needed. Amazoness Empress is a Level 8 Earth Warrior-type Fusion Monster with 2800 Atk and 2400 Def. The stats are solid for a boss, but this one plays too much defense. The requirements for fusion are Amazoness Queen and any other Amazoness. For the trouble, Amazoness Queen protects Amazoness cards from all destruction other than herself. A good effect for the theme, but defense doesn’t win games. Then she grants piercing damage to all Amazoness monsters. That’s certainly an offensive effect, but not really good enough. Finally, she brings back Amazoness Queen from anywhere except the banished zone if Empress leaves the field because of the opponent. She lives in the Extra Deck which would mean Amazoness would need a good way to get out Link Monsters to really take advantage of Amazoness Fusion support. And there aren’t any themed ones. Potentially, Empress could get better, but for now, her and her people will probably just live in obscurity. From one new product to the next, we begin Circuit Break by ranking the Top 10 cards in the Circuit Break set, averaged by everyone of us on Pojo who made a list. 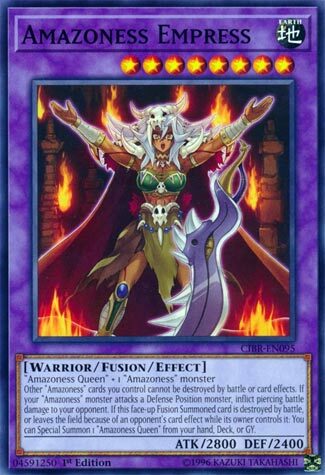 At the number 10 spot is one of the Amazoness Fusions that didn’t end up in Battles of Legend for some reason, Amazoness Emperess. Amazoness Empress requires Amazoness Queen and an Amazoness monster of your choice. Thankfully Amazoness Princess counts herself as Amazoness Queen on the field or in the GY, so you got another option to use for the Fusion Summon. While Empress is on the field, other Amazoness monsters you control cannot be destroyed by battle or effects. Oddly she doesn’t protect herself like the original Queen did, but the effect Empress has is easier to get off this way, but I feel Empress protecting herself would of been better maybe. All Amazoness monsters you control gain piercing, so your opponent literally cannot play defense against you, otherwise they will take more damange 8 times out of 10. If a Fusion Summoned Empress is destroyed by battle or leaves the field because of your opponent, you can summon Amazoness Queen from the hand, deck, or GY. Queen will allow you to have battle protection again, or you can summon Princess and get a search for an Amazoness spell/trap. Overall, this is a good fusion monster for Amazoness. With the other support they got, the deck is somewhat decent now. It’s the Circuit Break Top 10 (Cue the music!) Anyway, coming in at #10, and this may have been my #10 as I recall, is Amazoness Empress. I’ve said it before, and I’ll say it again, but new (and in this case, good and even useful) support for an old theme is a great thing. Empress has a LOT going for her, and her theme. She’s a Level 8, Earth, Warrior, with 2800 attack (all good things so far) and is Fusion Summoned with Amazoness Queen and one other generic Amazoness Monster. I guess it makes sense a Queen would fuse with one of her subjects to become an Empress, no? She protects all your Amazoness cards (save herself, for whatever bizarre reason, and the Queen did, if you recall) from Battle and Card Effects. The obvious downside here being, to get around this, just destroy Empress, but let’s continue on. She also grants all your Amazoness trample, which I’m a fan of. Finally, she can replace herself with Amazoness Queen when she leaves the Field, by Battle or Card Effect, and said Queen can come from your Hand, Deck, or Graveyard. Maybe that’s why they left her so open to destruction. I guess that keeps her from being too broken too. Good support? Definitely. But misses the mark of great. Next articleNew Yugioh Products coming this Holiday Season!